Following months of headlines featuring Apple’s supposed new iPad Mini, a Chinese firm has leaked parts to give the world an idea of how the miniature tablet will look. According to new information, the iPad Mini appears to have a 7.85in screen with an 1024 x 768 (163 PPI) 4:3 resolution and will look somewhat like a cross between an iPad and an iPhone, which will certainly suit most Apple fans. Apple’s reasons for launching a smaller tablet are pretty clear – the retailer has been heavily struck by Amazon and Google’s successes with the respective Kindle Fire and Nexus 7 tablets, so the iPad Mini will hopefully bring Apple’s tablet sales back up, and if early interest in the product is anything to go by it looks like it might just work. However, in order to be completely successful, Apple will need to outshine other Android tablets in every way by offering up a more comprehensive range of apps and content, as well as offering better value for money and having increased hardware specifications to lure customers in. All of this comes from a picture of the iPad Mini’s cassis, which a Chinese supplier supposedly leaked. The pictures have lead people to believe that it will be around the same size as Google’s Nexus 7, but that it will be thinner, and therefore lighter. Many have speculated that it could come out at around 7.5mm thick and 270 grams in weight, versus the Nexus 7′s 10.5mm thickness and 340 grams. No matter how many leaked photographs appear on the internet, no one will know how much Apple is going to sell the iPad Mini for until it is officially announced. This hasn’t stopped people speculating though. However, if Apple really does want to undercut Google to achieve tablet success, it will need to sell the iPad Mini for less than £200. Many people may think that Apple is set to win again, but the mere fact that it has to react to changes within the market shows that Android retailers have stepped up their game. Though the iPad Mini may bring Apple back into first place, Android seems to have successfully closed the gap and it seems it will only be a matter of time before a bigger and better Android tablet is released. What do you think of the latest iPad Mini speculation, will you be buying one? 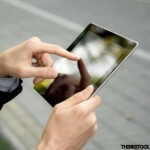 And do you think it will be able to steal some of the Android tablet market?